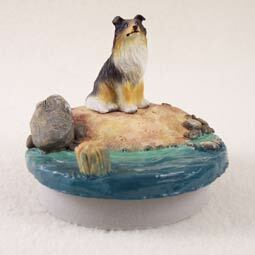 Collie Tricolor Candle Topper Tiny One "A Day on the Beach"
Home > Dogs All > Collie Tricolor > Collie Tricolor Candle Topper Tiny One "A Day on the Beach"
The Collie originated in the Scottish Highlands as a herding and protecting dog for the farmer and his stock. This breed’s devotion to family, especially children, has made it a very popular family dog. While the most famous Collie is undoubtedly “Lassie” their first notable brush with fame was Queen Victoria. Who upon visiting the Scottish Highlands and seeing the breed, immediately fell in love with it, making the breed quite fashionable. The Collie comes in the rough coat and also a smooth coat version. There are four acceptable color combinations for this breed, sable and white, tri-color, blue-merle and white. Their coats should be brushed weekly, and could need it more often in shedding seasons. This breed is extremely intelligent and its primary focus in life is its people making it an excellent service dog. The AKC recognized the Collie in 1885 in the Herding Group. Collies range in size from 22 to 26 inches tall at the withers and weight 50 to 75 pounds.